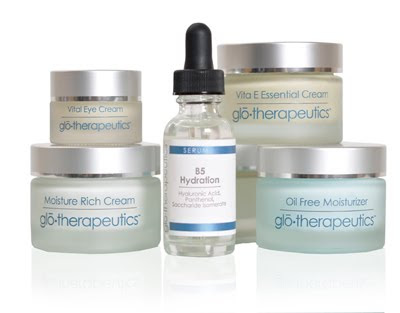 Denver, CO (July, 2010) - glotherapeutics, the skincare collection known for breakthrough-ingredients, high-performance formulations, and a signature systematic approach to skincare introduces five new products to moisturize and restore skin. For an extra dose of moisture, B5 Hydration Serum restores skin’s suppleness through a synergistic balance of nourishment and hydration. Keeping skin moisturized throughout the day, sodium hylauronate delivers and maintains water hydration to protect against free radical damage caused by environmental aggressors while pro-vitamin B5 increases the skin’s hyaluronic acid content and assists in stabilizing the moisture content. Leaving the eye area smooth and revitalized, the Vital Eye Cream contains de-puffing eyeliss to reduces dark circles under eyes, anti-inflammatory evening primrose oil to prevents dehydration, antioxidant and antiseptic rich chamomilla recutita (matricaria) flower extract to increase hydration and skin elasticity. To replenish and repair skin, Vita E Essential Cream, a flavonoid-rich antioxidant cream leaves skin plump and reduces the appearance of broken capillaries with strengthening hesperidin methyl chalcone. Preventative rutin stops collagen destruction; anti-oxidant enriched vitamin E/tocopheryl acetate boosts the immune system; and anti-inflammatory rose hip seed oil aids in cell protection while improving the skin’s elasticity. Moisture Rich Cream douses skin with nutrients to encourage restoration and repair skin to a flawless dewy complexion. A combination of anti-oxidant rich ingredients nourish while silybum marianu (milk thistle) extract reduces the effect of toxins and prevents oxidative damage to DNA caused by UV radiation while evening primrose moisturizes dry, dehydrated and extra fragile skin commonly associated with menopausal and Eczema prone symptoms. Blended with botanicals and essential hydrators, Oil Free Moisturizer lightly moisturizes and balance oily skin. Hydrating sodium hyaluronate protects against free radical damage, protecting algae extract enhances skin’s radiance, and elastin malachite extract increases the amount of collagen leaving your skin balanced. The products, launching fall 2010, range from $35.00 to $50.00 and are available at salons and spas nationwide or gloskincare.com. glotheraputics is a division of gloProfessional, the leading makeup, skincare and spa company dedicated to the professional and consumer markets. gloProfessional collections, including glominerals and glotherapeutics, are available at gloskincare.com, as well as salons, spas and the offices of leading physicians nationwide.